The place is a field dressing station. The wounded Grenadier Guardsman in the foreground on the left, wearing a German helmet and eating jam and bread, had brought in a prisoner the German who is sitting on the right with his hand to his face. 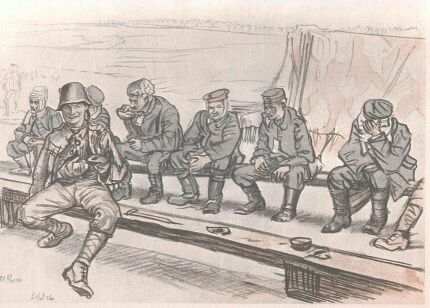 The Guardsman indicated the German to the artist, and said, "Won't you draw my pal here, too, Sir? He and me had a turn-up this morning when we took their trench, and he jabbed me in the arm and I jabbed him in the eye, and we're the best of friends." Other Germans are sitting in attitudes characteristic of newly-made prisoners.